Gabriel Preisser and Sarah Gibson in Wonderful Town. 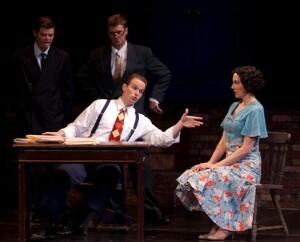 Skylark Opera’s fifth annual Summer Festival opens with Wonderful Town, a frothy delight set in 1930s New York City. With little point but to be entertained, we are free to skip from one clever song to the next, taking in the particular charms of each without a care. What makes this musical not just fun but truly worthwhile is the heavyweight writing team of lyricists Betty Comden and Adolph Green (they just don’t get any better than this for musical theater) paired with the music of Leonard Bernstein. This is an earlier piece for Bernstein, and it’s certainly not a West Side Story, but it has his signature quirks, particularly in the rhythmic Wrong Note Rag and Swing—also with tongue-in-cheek lyrics and perfectly matched choreography by Penelope Freeh. The book? Oh, well. It’s a 1950s musical about innocents making it in the big city, so as long as they can sing (and oh, yes, they can!) it all works. Sarah Lawrence and Sarah Gibson, playing sisters Eileen and Ruth, respectively, leave their hometown in Ohio to seek their fortune. (You might not be able to sing along with the tunes in this show, but I’ll bet you’ll wake up tomorrow with “Why-oh, why-oh, why-oh did we ever leave O-hi-o” stuck in your head.) Adventures and interesting characters, seem to follow them everywhere, providing all the excuses needed for snappy jokes and catchy dance numbers. The biggest pleasure for me was hearing a musical sung without a trace of the pinched, nasaly style that’s typical of Broadway shows today. (I rant about this a lot.) Instead we are treated to Lawrence’s effortless, sparkling high notes and Gibson’s pleasing alto. Lawrence plays the perky flirt; Gibson the slightly ascerbic elder sibling. Both delivered completely unaffected and beautifully defined characters—and they dance. Gabriel Preisser as Bob Baker, Ruth’s love interest, was a standout among the men, playing the leading man role among the characters Eileen seems to collect. That rich, luscious baritone was tailor-made for a love ballad. Top to bottom, the ensemble singing was glorious; the chorus of policemen on My Darlin’ Eileen was especially satisfying. The set, which functions for both shows running during this festival, was serviceable, but might have offered more entrance and exit options (easily done for the interior scenes, given the flats used). It also might have shared a “happier” color palette with the costumes. In fact, the lack of consistently clear color schemes made that aspect a little messy. Wonderful Town is directed by Robert Neu; Steve Stucki conducts a very fine pit orchestra. It runs concurrently with Skylark’s production of Mlle. Modiste through June 17. The theater is easy to get to right off 94 in St. Paul. Exit on Lexington or Snelling. Recommended.